As first time home buyers, we came to Rachel with many questions. Rachel was extremely informative and helpful. She explained to us the many options we had and suggested some neighborhoods to look at within our budget. During the house hunting process, Rachel spent many Weekends taking us to different homes. Rachel kept our budget, wants, and needs in mind every step of they way. Once we finally found ‘the house” Rachel was extremity helpful in providing recommendations and guidance through the inspection and closing process. Buying a home for the first time can be filled with anxiety and nerves. I am happy to say our experience with Rachel made buying our first home an easy, confident, and enjoyable experience for us.Peter M. & Lauren E.
Working with first time home buyers is always exciting. Sometimes I feel like I’m one part realtor, one part teacher and one part therapist. 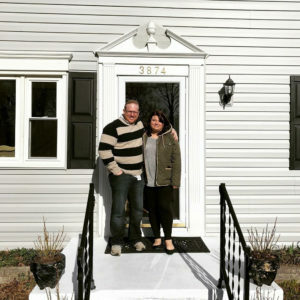 Buying your first home can be a scary and stressful process, but Peter and Lauren were ready to tackle it head on. When working with first time home buyers, I tend to start with an education about the process, what to look for in the home and financing details. With Peter and Lauren, we looked at quite a few homes. A running joke started while visiting homes, because we kept seeing homes that had sloping floors. I explained that structural issues with a home can be indicative of much larger issues that could cost you lots of money in the future. I advised them not to fall in love with a home just yet and to keep looking for a better option. Our patience paid off and they found an amazing home in a water access community with a great layout and beautiful yard. The kitchen needed some updating but was in working condition and Peter and Lauren are looking forward to renovating and creating their dream kitchen in the future. I’m so happy that I could help them find their first home and hope they have years of happiness together!